In this paper we demonstrate that the organization of the polymerase gene of toroviruses and coronaviruses is similar. The polymerase gene of both virus families consists of at least two large ORFs (la and lb). Four domains of conserved amino acid sequences have been identified in nearly identical positions in the 3’ ORF of the pol gene of toroviruses and coronaviruses. The most 3’ conserved domain which is still unique for these viruses encodes a 33-kDA protein in MHV-A59, which is cleaved from a precursor protein. Expression of ORFlb of the pol gene of both virus families occurs by ribosomal frameshifting. A predicted stem-loop structure and pseudoknot are conserved in the ORFla/ORFlb overlap of toro- and coronaviruses. 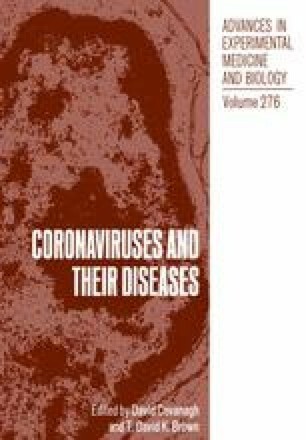 On the basis of these results we postulate that toro- and coronaviruses are ancestrally more related to each other than to other families of positive stranded RNA viruses.